Towering: Skyscrapers in Putrajaya as seen from a distance. The concept of Putrajaya is slowly changing with skyscrapers being built and Perbadanan Putrajaya (PPj) said the federal administrative capital was never planned as a low-rise development. PPj City Planning Department director Omairi Hashim said Putrajaya was planned as a compact city especially on the Core Island where most of the ministries and goverment departments were located. 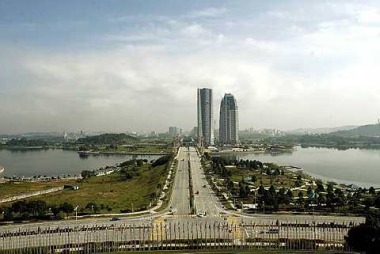 The buildings in the Core Island of Putrajaya are mostly five-storey tall. Omairi said skyscrapers were the latest development and the masterplan was approved by the Cabinet in 1995. “The skyline of the city along Persiaran Perdana (Boulevard) will rise to the maximum height of 40 storeys, becoming the landmark in the city,’’ he said. He added that the development was being undertaken based on approved layout plans as set out in the Putrajaya Master Plan (PMP). The master plan covers land use, categories of buildings, hosuing estates, mixed-use development as well green areas in Putrajaya. Development on Core Island is based on plot ratio, gross floor area, building height and typology of each plot. Omairi said building height was used to create an urban ambience at the Core Island. “The PMP has always considered the ‘Flying Path’ determined by the Department of Civil Aviation and as such the buildings will be within the gazetted maximum height,’’ said Omairi. Six skyscrapers, including four government buildings, are now being built in Precinct 4 and two in Precinct 5. Omairi said apart from the Putrajaya Core Area, there were five main precincts which are designated as Putrajaya Core Area — Precinct 2, 3, and 4 in the Core Island and Precinct 1 and 5. “The different height of buildings at the Central Business District (CBD), particularly along Persiaran Perdana (Boulevard) which links all the precincts on the Core Island are planned to create an interesting skyline,’’ said Omairi. He said the building height of between 18 and 20 storeys in Precinct 2, would be scaled down to about 15 storeys in Precinct 3 and increased to a maximum of 40 at the southern Boulevard. A long-time resident said he thought Putrajaya was meant to be unique with low-rise development. “The tall buildings should not be along the Boulevard. “The Putrajaya International Convention Centre (PICC) which was visible from the Prime Minister’s Office, is now partly blocked by the skyscrapers. “The area has lost its uniqueness. Even the beauty of the Seri Gemilang bridge is lost,’’ said the resident. He said the uniqueness of Putrajaya were the architectural buildings and the bridges and adding tall structures had defeated the purpose. As for the Peripheral area, the approved building height for commercial development is between two and four storeys, while high-rise apartments will be allowed a maximum of 17 storeys. Dynamic: Red Carpet brings the outdoors, indoors to visitors. In May, 500,000 Klang Valley residents and the immediate population of Kota Damansara will be in for a fresh and exciting experience when Encorp Strand launches Red Carpet Boulevard. Inspired by the famous Champs-Elysees in Paris, Encorp Berhad’s Red Carpet Boulevard has been crafted by world-renowned French architect Nicolas Ayoub with a contemporary twist. 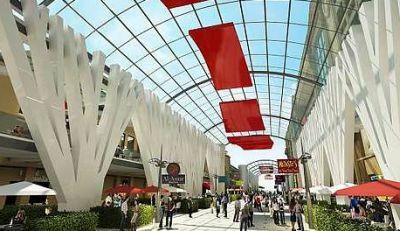 Its sculptured tree lines, French cafe-styled dining outlets and magnificent lights along the 800ft-long and 90ft-wide Red Carpet Boulevard are reminders of the elegant Parisian boulevard, while its glass canopy, suspended ‘flying’ red carpets above and climate-controlled environment provide a contemporary touch. “The essence of Red Carpet Boulevard can be summed up in one word — experience. It is a versatile concept built around the experience of life and celebration, and an inspiration of Paris as an ‘emotion’ rather than a ‘city’. We can adapt this to the Malaysian culture because Red Carpet is all about the feeling of an experience,” says Ayoub. The luxury in this landmark development is also the use of space, not just external but internal as well. “The space at Red Carpet is dynamic rather than static. This flexibility is what we call ‘living space’, which is ideal for dining and entertainment in an urban setting. Red Carpet brings the outdoors, indoors to visitors. It is a unique embodiment of French cafe culture, combining exciting gourmet adventures with entertainment. It is a place to see and be seen, just like the Champs-Elysees!” added Ayoub. Red Carpet Boulevard will be the longest and widest alfresco boulevard ever built in the Klang Valley, and it is poised to take its place as the most exciting dining and entertainment spot in the popular and prime “Damansara Belt” of Petaling Jaya. The F&B outlets fronting the boulevard are second to none, providing alfresco dining and entertainment at its best. The boulevard has been designed to provide communities with a new experience in dining and entertainment. Although typically French in design and inspiration, the offerings will have an international flavour by F&B tenants offering a variety of cuisines and concepts. A major attraction for Red Carpet Boulevard are its variety of both local and international thematic events and entertainment, which are currently being planned. Red Carpet Boulevard is events-ready. Facilities such as state-of-the-art sound system,specially designed lighting and fibre optic cables have been seamlessly embedded for a complete ‘plug & play’ experience for those who wish to hold events such as performances, film premiers, fashion shows, product launches as well as music and cultural festivals. The entire Red Carpet area will also be equipped with high speed broadband infrastructure, offering free Wi-Fi access to its visitors. “Red Carpet Boulevard is going to be a breath of fresh air simply because of its unique experience. What we are offering is essentially a winning combination of a complete dining and entertainment experience, which will be evident at every touch point when you first enter the Boulevard,” said Encorp’s executive chairman Datuk Seri Effendi Norwawi. The immediate population within a 5km radius of Encorp Strand has a high average annual population growth rate, registering 10.9% between year 2000 and 2007 and it is projected to rise to over 500,000 by this year. A rapid growth of population in this area is expected due to the active residential development in this blossoming township and its surrounding neighbourhoods such as Mutiara Damansara, Taman Tun Dr Ismail, Desa Park City, Damansara Perdana, Sierramas, Valencia, Mont’ Kiara and Sri Hartamas. These communities have an above average spending power and tend to have greater expectations on quality shopping, dining, leisure and business activities. More components are progressing well at Encorp Strand, namely Garden Offices, the shopping mall and residences, all of which will transform this integrated development into a complete living, working, shopping, dining and entertainment experience. Garden Office, which will be ready by 2012, is a unique vision for contemporary office space, where every unit as a corner unit and offers flexibility for both small and big business outfits. It has been designed with sky gardens on all blocks and 150-metre Skywalks, as well as green concepts and features such as rain water conservation, and natural sun shading. The centre of attraction at Encorp Strand will be the lifestyle boutique neighbourhood shopping mall, which is expected to open in 2012. Offering the best selection of dining outlets, bistros, lounges and entertainment clubs of international standards, the European-inspired mall embodies an atmosphere that combines perfectly with the outdoor experience of the Red Carpet Boulevard. Encorp Strand has attracted key anchor tenants for the mall. These include a cinema, bowling alley, fitness centre and grocer. The Residences, to be built just above the shopping mall, will be the icing on the cake. Characterised by its French architectural style, the 35-storey residential tower will exude high-end comfort, service, security and luxury with panoramic city views. Residents will have the luxury of a complete 360 experience in their own backyard, complete with clubhouse amenities.